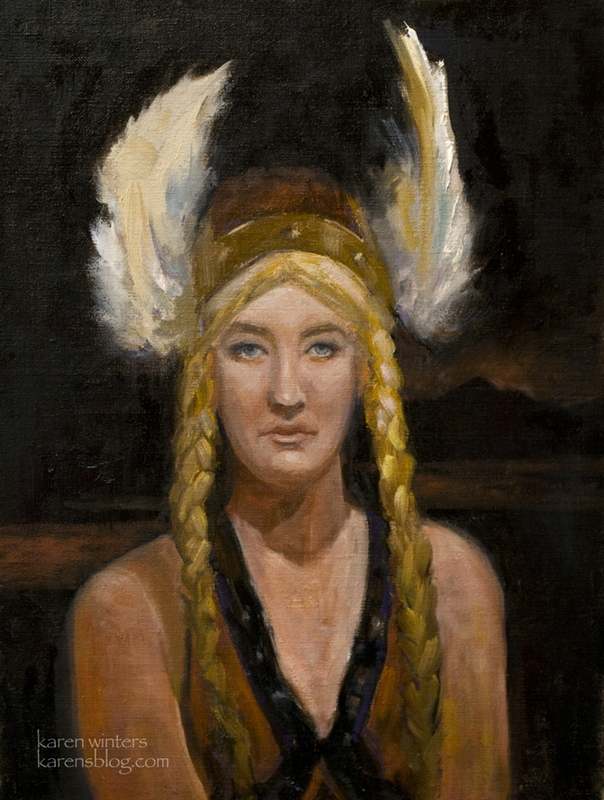 This portrait was painted in conjunction with the performance of Wagner’s Ring Cycle, which is in its final week in Los Angeles. The model for this painting was a high school student in Orange County, who may have been about the same age as the noted Valkyrie. Unfortunately the lighting on the model in my position was flat front-lit, and I was unable to move nor make changes to the lighting. Still, it was a good exercise and I”m satisfied with the outcome of the project. 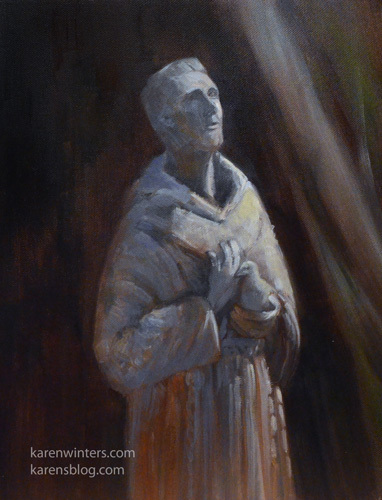 My portrait of Wotan (below) is currently hanging at the Cathedral of our Lady of the Angels until July 16. This painting has been selected to be included in a special exhibition coordinated with the production of Wagner’s Ring Cycle in Los Angeles this May. For more information about the CAC’s participation in this festival. This painting depicts a moment in the opera “Siegfried’ when an aged Wotan (Odin) takes on the guise of a wanderer to roam the earth. Weary and downtrodden, he seeks out wisdom from the earth mother, Erda, who sleeps in her cave. 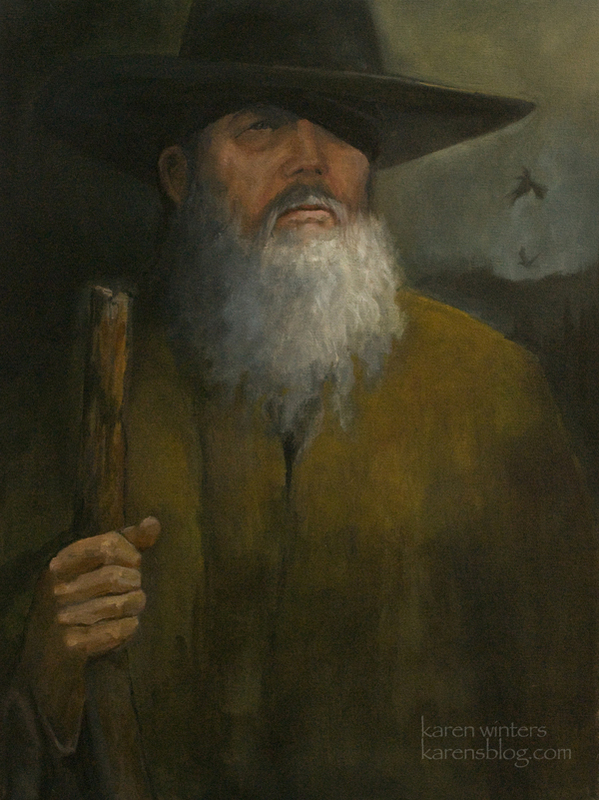 His two companion ravens, Thought and Memory, accompany him on his journey. His hand clenches his ash spear. My model for this painting is a much younger man, but he is Nordic so I thought that this would be a good starting point for the exploration. I’ve been gone on a painting trip to Central California with the California Art Club, and was in such a hurry to make preparations for the weeklong paintout that I didn’t have a chance to post this before. The paint out was fun, but marred by a rainstorm that hit on the 2nd day and continued throughout our time there. We stayed on, though, catching patches of sunshine and moving around San Luis Obispo Country to find places where the light was better. 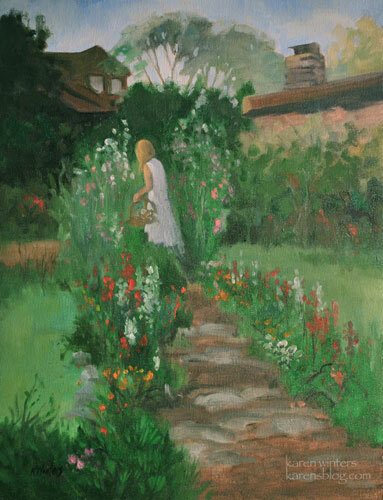 All in all, it was a wonderful trip, and I’ll be posting some of my plein air paintings here soon. Along with my landscape painting, I’m getting interested in figurative work, and occasionally make time to paint from a live model as I did this last weekend at Randy Higbee’s studio in Costa Mesa. The assembled painters had the opportunity to paint this lovely woman, Toni, wearing one of her many period costumes. This one is reminiscent of a Victorian or Gibson Girl era. 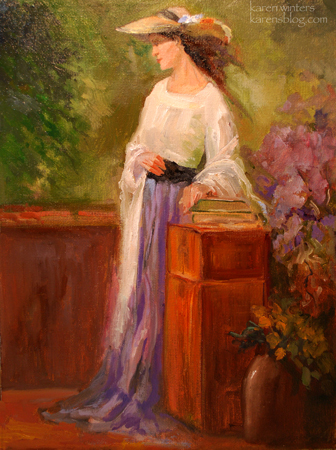 Rather than paint her in a contemporary style I chose to interpret her using a style more appropriate to that historical period. Painting out of my comfort zone is a lot of fun. It shakes things up and forces us to think differently about what we are doing. Where my California landscapes might be right at home in a craftsman home or California bungalow, this one would probably fit in very well in one of those San Francisco “painted lady” Victorian parlors. 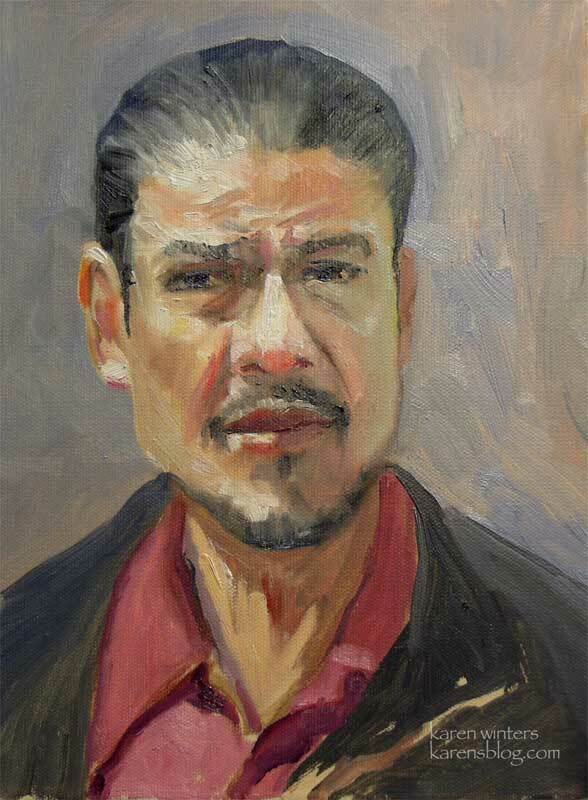 No, I am not putting landscape painting aside; I will continue with it as always, but I am interested in doing some portrait painting in oil, which has an entirely different feel and way of working than portraiture in watercolor. This was painted in one session, starting with a sketch and progressing until all of the canvas was covered with paint. I don’t know this man; he was listening to a speaker at an outdoor event and I liked the look of his face. Yesterday I had the opportunity to return to the Hillside Getty in Sepulveda Pass for a little drawing practice. 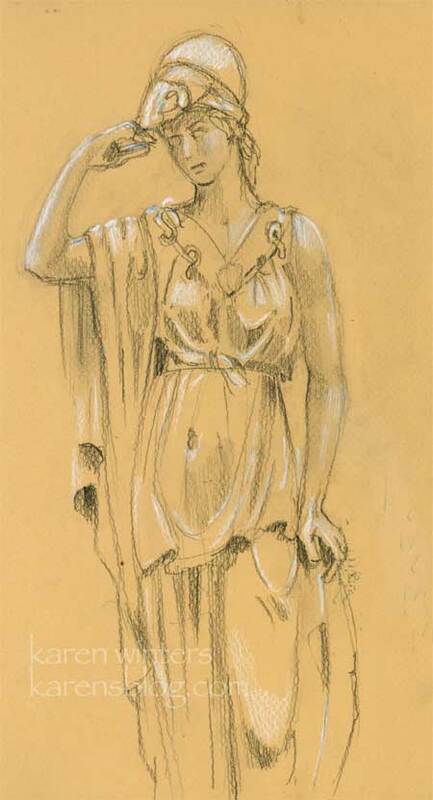 I just had time for two drawings this time – This first was this Minerva, the Roman equivalent of Athena, goddess of war. Unlike the Malibu Getty where there are numerous seats for viewing the sculptures, at the Hillside Getty they want you to keep moving so drawing means standing and balancing the sketchbook on your arm which is what I needed to do here. I much prefer the stability of working on my lap, but sometimes you just need to make do. There were throngs of people, as usual. I started drawing this from one angle which was completely unsatisfactory and I turned the page over to begin again. A group of women walked by and asked if they could look. Rarely, I say no, but this time I did. “Is it bad luck?” one asked. “Yes, I said, it’s bad luck.” Gotta remember that one. Later another woman asked to see and I was far enough along that I was happy to show her the drawing in progress and we chatted for awhile about both Gettys and their Friday evening drawing class which happens twice a month. The gallery guard stopped by periodically to see my progress, too. He was a really nice guy and seemed to enjoy seeing the drawing take form. 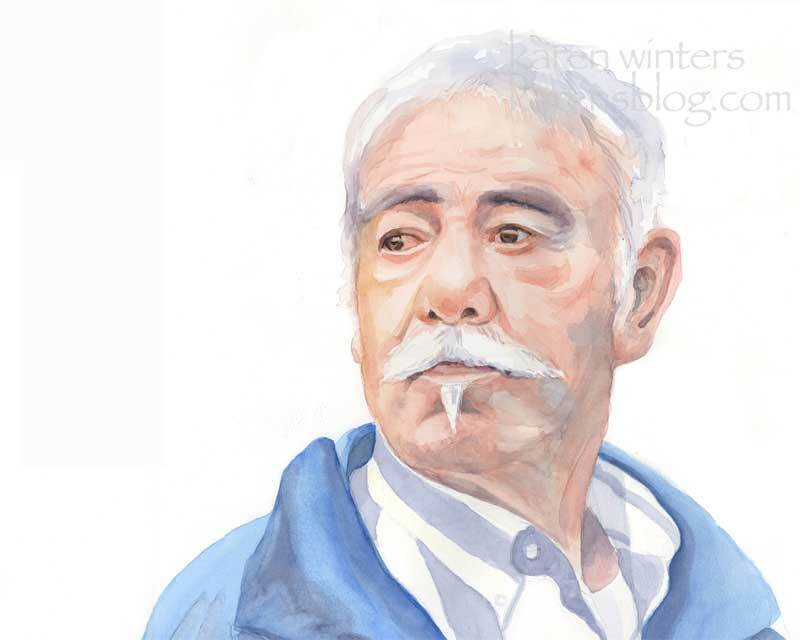 He said that an artist occasionally draws upstairs in the painting gallery but he scowls at anyone who attempts to speak to him so that says to me that people generally don’t know what kind of reaction they’ll get from someone who’s drawing. If I’m drawing indoors with plenty of time, I don’t mind stopping and chatting. But if I’m chasing the light with a watercolor outdoors, whoa, that’s a different story and I’m guessing my body language communicates that, too. “As the Parade Passed By” – 12′ x 15″ watercolor on paper. Last week, I got some very good news that I’d like to share with you. If you’ve been following this blog for the last year or so you can imagine how much this “first time” means to me. I found out that this new painting, “As the Parade Passed By” has been juried into the Natl. Watercolor Society’s all member show, which will be hung in about a month at the VIVA gallery in Sherman Oaks, California (in the San Fernando Valley.) I am delighted to be included in this show of other NWS members and look forward to becoming more involved through activities and future competitions as well. The painting was developed from an original photograph I took at a parade not too long ago. The man had a faraway look that I wanted to work with and enhance in watercolor. It was painted about two weeks ago. The watermark, of course, is not on the original. When I got my MJ at UCLA, one of my favorite J-school classes was photojournalism. To be able to fade invisibly into a crowd and capture a face, a look, a moment, still fills me with excitement. Translating that into another medium has made the experience all the more enjoyable and precious. 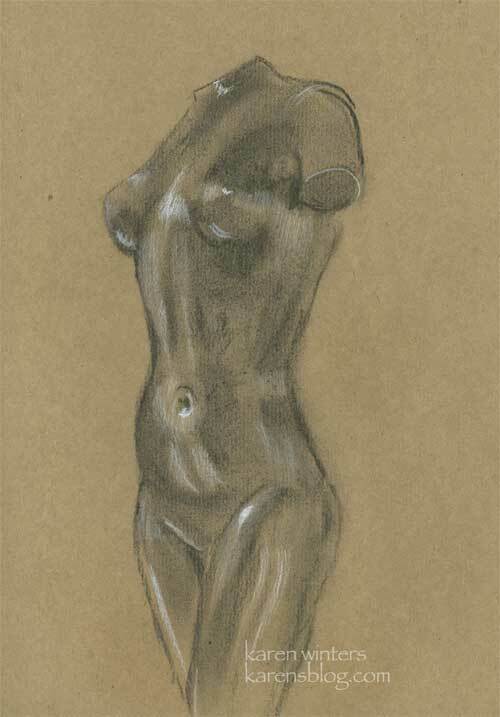 In the sculpture garden of the West Pavilion are several Maillol bronze nudes, two of which I had time to draw. In many ways this was more challenging than the interior marble sculptures because of the dazzling bright sunlight and the dark reflectivity of the of the form. For this surface I switched to a vine charcoal to suggest the contrast. If you usually paint big, paint small. When you’re tired of using watercolor, try pastel or acrylic. Always work in color? Try black and white. If you’re getting bored painting landscapes, paint people. If you usually paint people, try a still life. Always draw with pencil? Try charcoal. If you always draw with a dip pen and ink, use a brush pen instead. When you get weary of doing finished works, do a series of quick studies. If you always paint tight, loosen up. If you always draw on white paper, try drawing on toned paper. Always gravitate to bright colors? Try a subdued palette. Too weighed down with reality? Try a fantasy scene from your imagination. Tired of realistic representation? Have a little fun with abstraction. galleries and get fresh inspiration. Try an old subject in a new technique. Try a new subject in a familiar medium or technique. This ‘shake things up’ approach may not work for everyone, but it keeps me from ever feeling bored. Give it a try! Here’s another in my figure drawing expedition from Friday at the Getty. 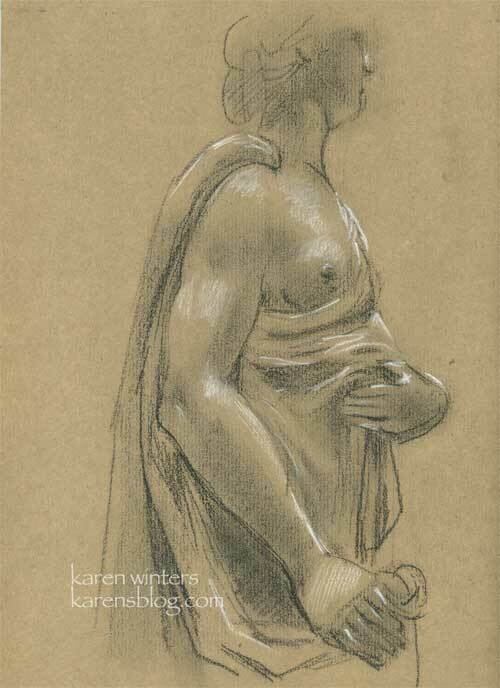 This is also based on a work by Joseph Nollekens was drawn from the same low sitting angle as yesterday’s Venus. Because this statue was much closer to me, I opted to just concentrate on a portion of her torso. This was about a half hour drawing. Taking longer might have helped avoid many of the mistakes, but I wanted to experience a number of different works, so that’s the compromise I made. If you like to practice draw people, I strongly recommend visiting museums and drawing from the statues. Unlike live models they don’t need breaks and they are happy to hold the pose as long as you require. The lighting is usually wonderful, the better to understand the volume of the form. I would imagine that this experience is not unlike the drawing from plaster casts which classic atelier students did, and still do. When I visited the Getty villa for a drawing class several weeks ago, our instructor advised us that when drawing folds to not try to draw every one, but to simplify the form, so I’ve tried to apply some of what he shared with us. The Getty is a great treasure for learning and pure enjoyment. My gratitude is renewed every time I visit. I have two more drawings to post, based on sculptures by Maillol … coming soon.